Happy New Year! I hope everyone had a fun time ushering in the new year last week. I stayed home and at the stroke of midnight, we enacted several unique new year's eve celebrations we found on the internet. Who knows if these superstitious things are regionally accurate, but they sure were fun! Eating black eyed peas (U.S.), wearing red underwear and polka dot clothing (Philippines), jumping off chairs (Denmark), and eating 12 grapes at the stroke of midnight (Spain)-- you're supposed to put them on a skewer stick so we ate them on our light-up Star Wars chopsticks we received last Christmas. Our favorite wacky tradition is from my mother in law-- where you'll have good luck if the first person to walk through your door is a tall, good-looking man carrying a loaf of bread, a glass of wine, and cash in his pockets. Either it's a cultural tradition (she's Italian) or it's a family tradition they made up. Either way, I love it and we do it every year (except for last year and 2015 sucked so we learned our lesson! Then we danced outside until it got too cold so we moved the dance party indoors. I know, we're weirdos. I've since made another ambitious yet reasonable list of things I want to accomplish this year. My obligatory personal resolutions for the new year generally range from the mundane ("I want to meal plan and cook more consistently") to the downright frustrating ("I want to get back in shape this year. No, really."). However, I have a few new resolutions focused on unique, creative solutions that will make me happy. One of these resolutions includes finishing more miniatures. I want to finish 20 miniatures this year-- speed painting, commissions, personal development in painting techniques, etc. That's roughly 2 miniatures per month, which is conservative compared to my original goal of 30 miniatures per year. 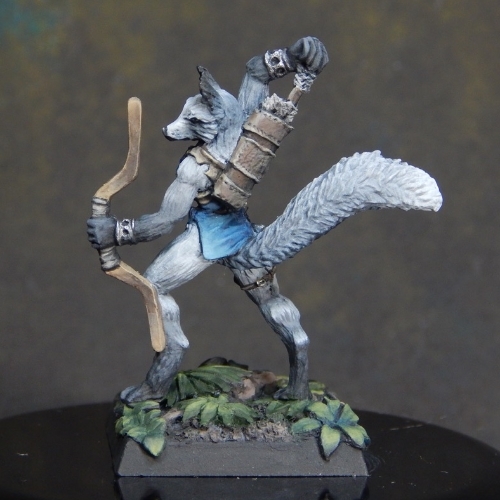 This year, I ended the year with more works in progress than actual finished miniatures. For most people, that usually means that progress is being made, however, mine's more of a stalled creativity and I-wiish-I-had-more-time situation. I still struggle with carving out time to paint during the weekday and the holidays have been particularly challenging in this regard. To start the new year off right, I sat down and cleaned my desk and miniature storage (not pictured). It's a daunting task, trust me. It hasn't been this clean in months! I then worked on my "Secret Sophie" miniature that's due January 15, 2016. Basically, it's Reaper's version of the Secret Santa gift exchange. I'm incredibly glad they decided to make the deadline mid-January instead of during the holidays. I got to spend more time on it this way. My Secret Sophie likes to play animal-based characters, particularly silver foxes. 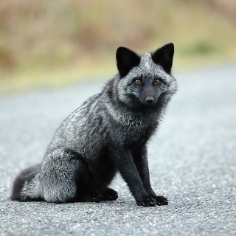 When I googled "silver fox", the animal that I found didn't look how I had imagined. Silver foxes are mostly dark grey with black ears and legs. However, I considered the style of silver fox kitsune characters common in anime, so I decided to lean more toward the left image below. I had some issues with the tip of the bow coming apart, and I'm glad I was able to resolve it-- at first glance, you would never know that I had to resculpt and attach a top section of the bow. Other than that, I've acquired some new basing materials that were WAY bigger than expected and finishing up my Shinobi. He's SO close to being done-- you'll see final pictures of him too soon! Then it's off to finish Carla McCarthy (I know, I know) and I'll be all caught up. Now to get this miniature shipped off to my Secret Sophie-- I hope they like it! I wish you all the best in 2016! May your year be full of peace, love, and creativity. May we have more finished miniatures than works in progress this year. Happy New Year!